Animals used for therapeutic services are seen all over the American landscape, but their presence in children’s literature is just now making its foray. 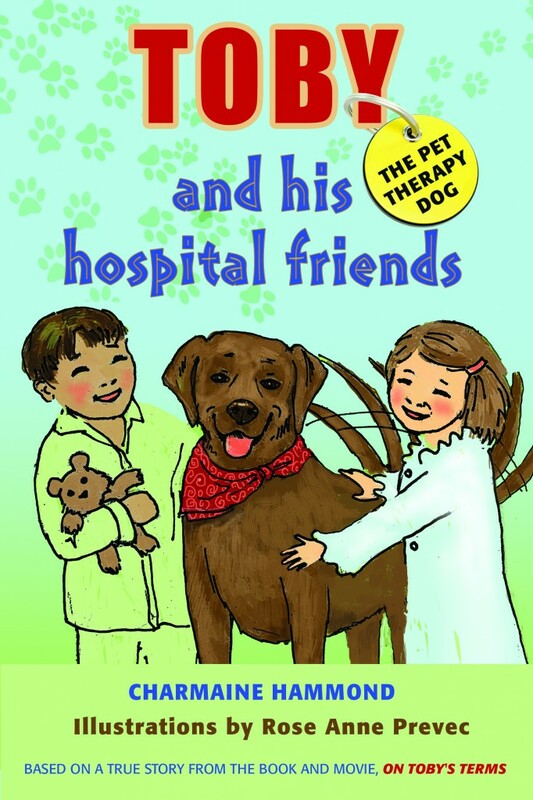 After chronicling her struggles with the real-life Toby (read: destructive, erratic behavior) in the adult work On Toby’s Terms, author Charmaine Hammond scripted the first in a series for kids – Toby the Pet Therapy Dog and His Hospital Friends. This early reader is a basic introduction to the purpose and need of therapy animals. Toby, referred to as (my pet peeve) “it” only once, is the canine companion of Miss Charmaine, who takes him every Wednesday to the local hospital. Toby visits with and cheers up patients both young and old. He accompanies an elderly woman on her walk, falls asleep during storytime, and helps a young girl overcome her fear of dogs. All in a day’s work! Overall, Hammond carries out a tenderhearted telling of an important relationship within the human-animal bond, and the illustrations are painterly, sweet and honest. This book is a great starting point for any child curious about animals trained for therapy. I think the topic of animals in therapy is an interesting one. When I was in high school, my animal rights club did animal therapy at a nearby retirement home with Alzheimer patients. I brought our dog who seemed to enjoy going for a ride and getting some extra attention. Now, I’m fortunate to live with Cassie, a cat who’s extraordinarily attentive to people when they’re sick or hurt. I’ve always thought that if I ever needed to stay overnight in the hospital, I’d want Cassie there with me. It is an interesting topic. Last year I met some gals from a SoCal Humane Society at an elementary school career day and they told me they even bring the dogs to college campuses during finals, in an effort to relieve stress. They also mentioned that the dogs do need regular breaks from all the petting and attention.